Everyone at JayMarc Homes has a nickname; a clever moniker given to them by their fellow employees after 60 days on the job that not only conveys the personal and professional qualities of each person (example: “Material Girl” for purchasing agent Sarah Feldman), but is also indicative of the company’s inclusive, club-like culture, which encourages both entrepreneurship and collaboration. 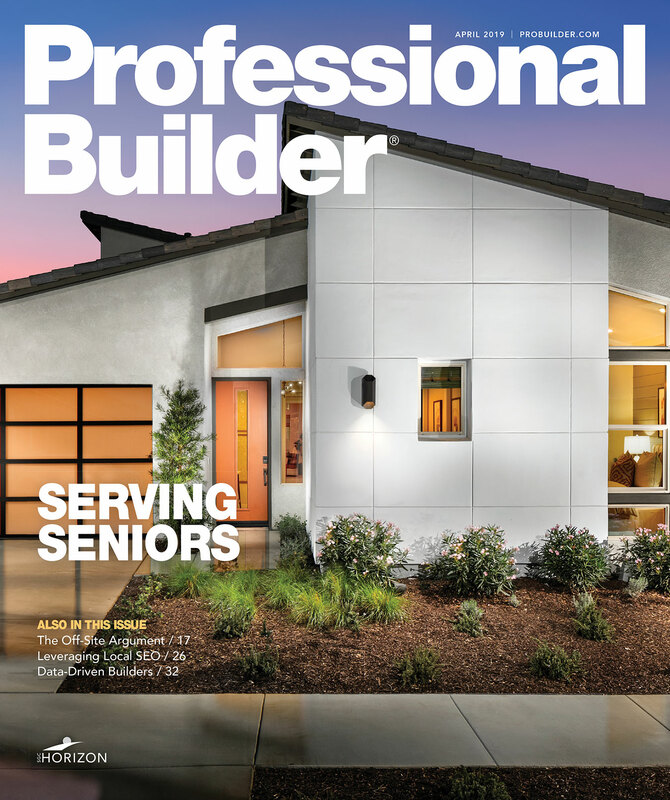 If that isn’t a model for the future of the home building business, maybe it should be. 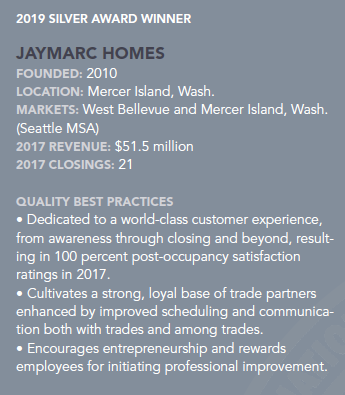 After all, on its first-ever try for an NHQ Award, JayMarc earned a Silver, which means it’s doing a lot right. 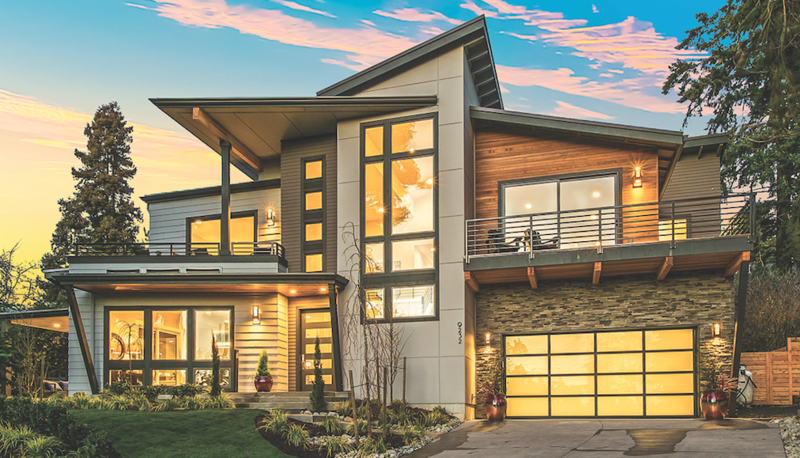 That’s pretty heady for a builder that rose from the ashes of a land development company after the Great Recession to arguably become one of the best-run and successful luxury spec and custom home boutique builders in Seattle’s West Bellevue and Mercer Island communities—a relatively (and purposely) small market that has attracted the attention of a handful of competitors, including a few nationals in the area looking to cash in on what appears to be an insatiable appetite for $2 million-plus homes in and around Lake Washington. The NHQ judges agreed, recognizing JayMarc’s dedication to delivering a delightful and memorable customer experience, practicing open-book transparency throughout the 36-person company, engaging its trade partners to improve construction quality and earn loyalty, and rewarding employees for seeking out best practices and pursuing continuous improvement. Other recognized strengths include a “safety net” of cash to provide a measure of security during the next market cycle; a nimbleness in responding to issues through weekly production meetings with a cross-section of department reps; and a commitment to construction quality through collaboration and consultation with outside experts. The judges also praised the company’s Waves of Innovation, a collaborative, creatively illustrated brainstorming exercise that has mapped a journey for JayMarc through 2024, including an anticipated market dip in 2020. After spending the first eight years of the company’s existence as its sole visionary, Rousso opened his whiteboard to others on the team. “I wanted to incorporate the thoughts and dreams of the talented people we have to be a part of our future,” he says. Of course, JayMarc isn’t without opportunities for improvement. The judges asked for measurable metrics and a process for employees to assess the performance of the leadership team. They also encouraged the company to engage trade partners in strategic planning efforts and customer survey responses, to optimize existing software programs to glean more and better construction-defect and warranty data, and to consider networking with other successful builders as part of its continuous improvement tenet.